Recorded: Budokan Hall ,Tokyo Japan, March 22nd. 1976. Comments: Tarantura released Queen Get Your Knickers Off. Utilizing a Mr. Peach tape, this covers the first night of the Japanese A Night At The Opera tour on March 22nd, 1976 in Tokyo. Previously the earliest tape from this tour was the following night in Nagoya, so this release documents a previously unheard show. THIS is the 2nd. re-release of this 2cd. Same cover, but some text printed in yellow. Queen second tour of Japan, after they scored their biggest worldwide hit with single ”Bohemian Rhapsody” and LP A Night At The Opera, began on March 22nd in Tokyo and covered ten shows in six cities. 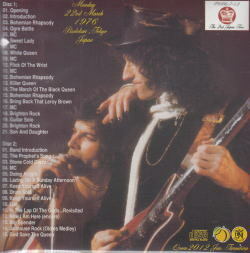 Nine of the shows were taped and in circulation and were the source for many titles on both vinyl and silver pressed disc with the second night of the tour in Nagoya on March 23rd the earliest. The opening night in Tokyo was the missing link. Get Your Knickers Off on Tarantura is the first time the opening night has been made available. It is a Mr. Peach recording of the entire show, including the long audience-cheering encore interludes. Compared to other Peach recordings it is slightly distant from the stage but still very clear and detailed. Eleven days followed the final show of their US tour in San Diego on March 12th and the band sound, during the initial numbers, well rehearsed and enthusiastic to be in Japan again. The Kenny Everett opening tape leads into the already famous operatic middle of “Bohemian Rhapsody” before the band come on stage for the hard rock final verse. Brian May breaks a string during “White Queen” and has to switch to a spare guitar in the middle of the song. It comes close to ruining what is an otherwise excellent performance. Afterwards May tells Tokyo “it’s good to back. It’s been too long. We’ve been away too long” before introducing “Flick Of The Wrist” from Sheer Heart Attack. The medley is fraught with problems. May botches the guitar part in the “Bohemian Rhapsody,” playing a strange out-of-tune melody, and Roger Taylor’s mic cuts out (or he misses a cue) in “The March Of The Black Queen” (the “my love is in your hand” part). Things improve afterwards. “Brighton Rock,” which Freddie introduces by saying “is a song that we didn’t do last time, but we’re gonna do it now,” is extremely heavy and powerful. The guitar solo segues into the well-worn “Son And Daughter” riff and that song’s climax. “The Prophet’s Song” is May’s second epic played in a row. Freddie duplicates his vocal gymnastics effectively before the song segues into “Stone Cold Crazy.” The contrast between the finesse of the former and heavy metal crunch of the latter is startling. “Liar” is notable for the utter enthusiasm of the Tokyo audience, clapping along and responding to Freddie’s “I’m gonna be your slave…” with “ALL NIGHT LONG.” It is a very big, long and loud sing-along. May’s introduction to “In The Lap Of The Gods…Revisited” is cut. “Now I’m Here” and the oldies medley close the show. Tarantura package Get Your Knickers Off in a gatefold cardboard sleeve with several rare photographs from the 1976 tour of Japan. 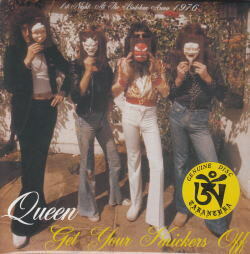 It’s a very nice release, a true gem, that is highly recommended for Queen collectors.